Happy Thanksgiving from Chi Phi! Home » Blog » National News » Happy Thanksgiving from Chi Phi! Happy Thanksgiving! We hope that your day is filled with family, friends, and plenty of food and drink to go around. With the Holiday Season upon us, many of us find ourselves reflecting upon the people and places which have made us feel at home throughout the years. The Brotherhood we have found in Chi Phi and the moments we shared with Brothers on campus and after graduation are at the forefront of what we are thankful for year after year. It is because of these memories with men like you that we have continued our involvement with the Fraternity and the Educational Trust to Build Better Men who, decades after graduation, will find themselves as grateful for this shared bond as we are. In the spirit of Thanksgiving and the Holiday season, the Educational Trust has announced the 2018 Founder’s Day Campaign. With a goal of raising $20,000 to continue providing scholarships, innovative educational programming, and support for our Chapters and Colonies across the country, the Founder’s Day Campaign is just one part of our commitment to creating a better future for our Brothers. Thank you for your continued spirit of support for the mission of the Fraternity and Educational Trust. We hope to see you at a Chi Phi event in the future, including the upcoming Chairman’s Dinner during Alphas and Thetas Academy in Atlanta. 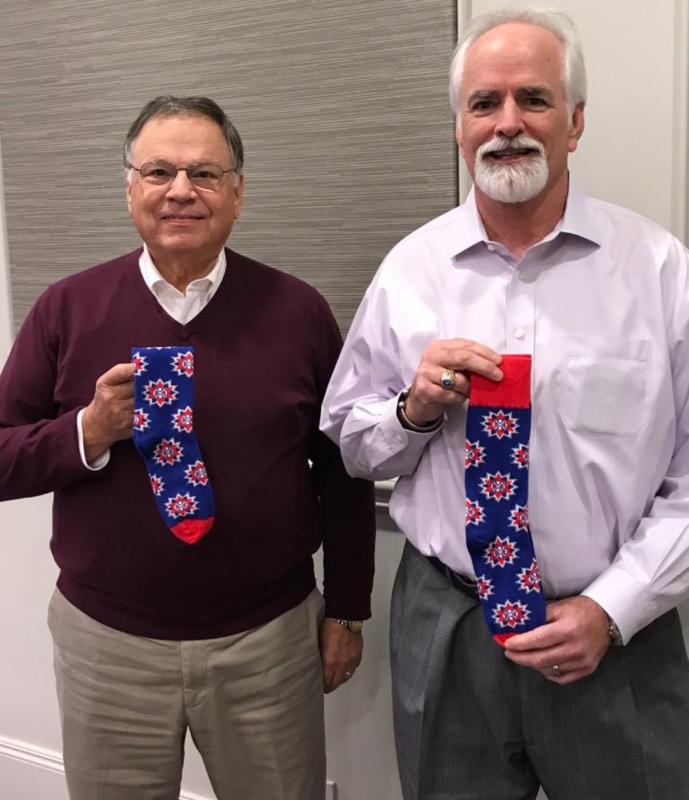 Contributions of any amount are deeply appreciated, but those giving $100 or more to the Campaign will receive a pair of our limited edition, never-before-seen Chi Phi dress socks. Hurry, our supply is limited! Brothers Walker and Skelton have already claimed theirs! You can join them by making your donation today.